This rose quartz guided meditation, meant to help heal hurts of the heart, is excellent for group gatherings. A leader will be needed to serve as the meditation guide to read the italicized text below. Be sure to have a supply of rose quartz crystals for your gathering. Each person needs to have a crystal to hold during the meditation. Or you could request that everyone bring one of their own for using during the session. If you do supply the quartz stones be sure to clean them prior to the gathering. Also, if the stones are not meant to be gifts to the participants and you take them back after the meditation, then naturally you will need to cleanse your crystals again. 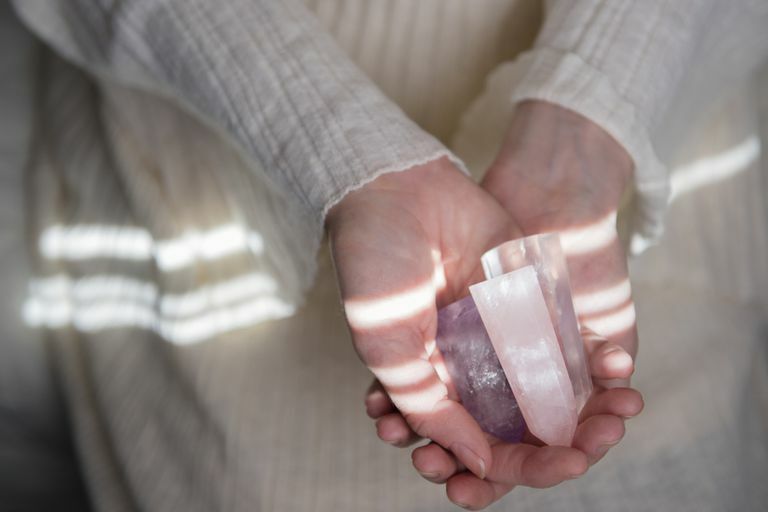 As we begin the meditational, hold a piece of rose quartz in your receiving hand. To determine which is your receiving hand ... if you are right-handed, put it in your left. If you are left-handed, put it in your right hand. The heart stands at the center of all energies and unifies our being as a whole. It is the point around which all the energies turn. A discord or imbalance in the heart chakra will adversely affect all the other centers. A clearing of the heart chakra will improve the interaction of all the other centers. It is important to maintain a balance in all the energy centers so a healthy level of awareness is manifested in our everyday lives. If more concentration is given to the upper chakras, then the lower energy centers lose sensitivity and function. If more concentration is given to the lower chakras then the upper energy centers will become cloudy and not function properly as well. Proper balance is the key. ​As we begin this meditational, if you have a piece of rose quartz, get it now. If you don't have rose quartz, use an emerald, malachite, or some other stone that aligns with the heart chakra. Hold this in your receiving hand. Take some peaceful breaths of cleansing and renewal. Feel the breath draw life into the body and the spirit. Breathe deeper and feel the breath draw not just from the air around you but also from the earth below. Breathe in this earth energy with each breath. Breathe with every pore of your body, feeling the awakening that is beginning to happen. Allow the life-giving energies to pour into you and renew both your body and spirit. Let the earth energy surround you and flow into you. Feel it pulsing through your veins and surrounding you altogether. Continue to breathe this way, slowly, and begin to relax even more. Now you are moving again, farther and farther into a field of clouds. You are very pleased and refreshed by the unique shapes and colors of the clouds. Watch how they form and reform, turning gently and constantly on themselves in an endless dance. You look ahead and see the clouds are denser as if they are "hiding" something. The closer you draw, the clouds start to thin out; as they start to become transparent, they gracefully pull away. Now they have pulled back altogether to reveal beautiful pink rose quartz. Look closely at the color and notice the intensity of pure color that it radiates. Feel the warmth of the pink. Allow that warmth to wash over you. As it covers you from head to toe feel the love that is radiating from the rose quartz. Let it seep into your every pore, every fiber of your being. Receive the love that is being given to you freely. The color pink is as deep as it is radiant. It is very pleasing to the eye, and you feel yourself being drawn into it; you feel yourself passing through the walls of pink, and now you are suspended within. You notice the graceful intricate archways of pink surrounding you. You feel a slight breeze move through and hear a sweet melody, one note after another as the breeze goes through the arches to create this melody. Another breeze stirs again, and you hear the harmony, and this harmony comes from deep within your being. It is part of you; it is you. You feel it in your heart as it vibrates throughout your entire body and spirit. It pulses through you with great strength in all directions at once. You are recharged and renewed. As it sings through your body you have a great feeling of power and joy; all fatigue and discomfort are passing away. The strength of the color pink and the vibrations of the rose quartz are sweeping through you—cleansing, renewing and restoring every fiber of yourself. You feel the center, in your heart, like the hub of a wheel and all other systems of your body are drawing from and reflecting this love to your other energy centers. They are drawing this love-giving power through them to be restored in turn. You are filled with breath, strength, joy, love, and compassion in this newly found energy. You also know that you can draw upon this energy to restore yourself on any level of the body or spirit. This energy is here for you, whenever you would want it to be. You are part of this energy and it is, as always, a part of you. Now you begin to move back, leaving the archways of pink. You continue stepping back farther and farther until the rose quartz is completely within your field of vision. You see it turning gently and peacefully. The clouds are moving again in around the rose quartz. They curl, roll, and cover it. You are moving farther and farther away and drawing back into your physical body. You become aware that you are centered again within it. You feel it surround you and you are comforted by its familiarity. You realize that your body has also been renewed and refreshed while you were in the midst of the profound love you just experienced. This gives you great pleasure. Now breathe deeply in and out and feel the body's life systems awakening. Breathe deeply again and as you release the breath, you become aware of all the sounds of life around you. Breathe a third time—you are fully awake, refreshed, renewed, and remembering all that you have learned.